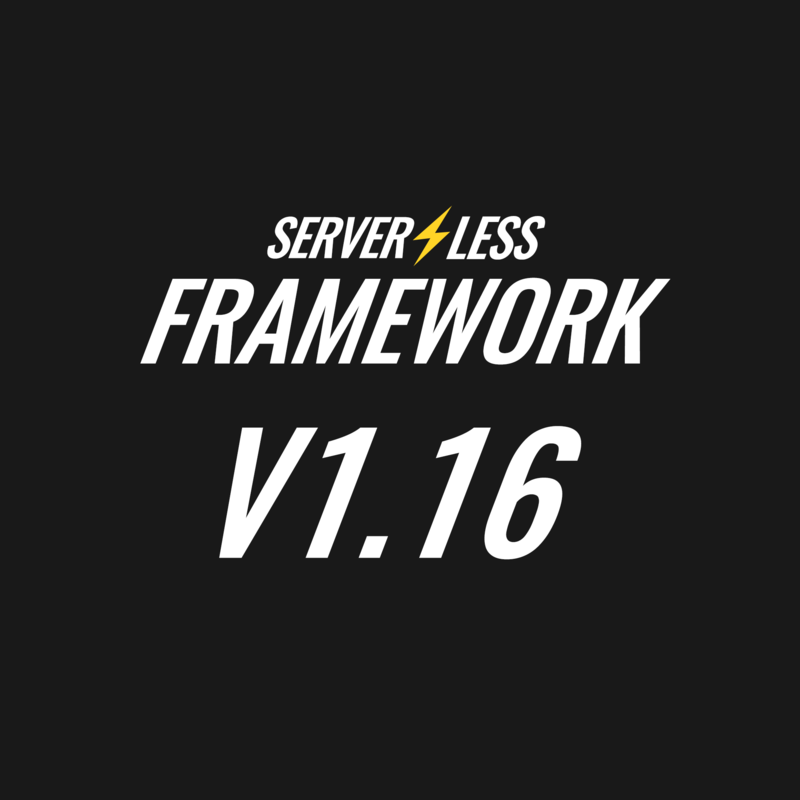 We're proud to announce the v1.16 release of the Serverless Framework! This release introduces new features, improvements, and bugfixes. Let's take a look at all the new features v1.16 offers. You can find a complete list of all the updates in the CHANGELOG.md file or watch the video below. Kudos to Ryan H. Lewis (@ryanmurakami) for taking the time to record this video! Serverless uploads and stores different revisions of your deployment artifacts including the services .zip files and the CloudFormation templates in a dedicated S3 bucket. The Serverless Framework creates and manages this deployment bucket by default. However you can also use the deploymentBucket configuration parameter which is nested in the provider property to specify a predefined S3 bucket which should be used when uploading and storing your deployment artifacts. With v1.16, we're adding support for server-side encryption options for such buckets which ensures that your artifacts are encrypted in your bucket once uploaded. Let's take a look at how you could use this feature. The first thing we need to do is to create our new S3 bucket which should be used to store our deployment artifacts. That's it. All files which will be uploaded to this bucket will be encrypted from now on. You can read more in our deploying to AWS docs about this feature. API keys are a widely used feature to enable/disable access to different endpoints of your API offering. The introduction of "API Gateway Usage Plans" makes it possible to control the usage patterns your API should support in a fine-grained way. A recent AWS update finally added support for this feature in CloudFormation which makes it possible to automate the setup process. Serverless v1.16 takes advantage of this addition and adds native serverless.yml support for usage plan definitions. Note: Please make sure to enable usage plan support in your AWS API Gateway console by following the steps in the announcement blog post. The Serverless Framework's package plugin includes a sophisticated zipping utility which gives you control over the .zip file creation process through config parameters such as exclude or include. Most of the time the functions you work on rely on different 3rd party packages whether they're production relevant packages or packages used to streamline the development process (e.g. test runners, offline utilities, etc.). In recent versions, Serverless included all your Node.js dependencies by default. This means that your production dependencies as well as your development dependencies are included in the final .zip artifact and uploaded to your deployment bucket. Such deployment artifacts can easily get quite large in size. Serverless v1.16 changes this behavior and introduces a step which analyzes your dependencies while excluding development dependencies from the final .zip deployment artifact. This feature is currently supported for Node.js runtimes and is enabled by default. Do you have ideas on how we can add support for other runtimes as well? Please let us know by opening up a new issue! Note: Serverless analyzes and excludes development dependencies from all your package.json files, no matter how many package.json files you have or how nested your directory structure is. This release also includes lots of bug fixes and several other enhancements. Thank you very much for reporting bugs and opening issues! This release contains lots of hard work from our awesome community, and wouldn't have been possible without passionate people who decided to spend their time contributing to make Serverless better. Serverless has a really helpful, vibrant and awesome community. Want to help us build the best Serverless tooling out there? Contributing isn't just about code! Chime in on discussions, help with documentation updates or review Pull Requests. Just filter by our labels such as easy-pick, help-wanted or needs-feedback to find areas where you can help us! Furthermore, we're always seeking feedback from our community to build the features in the best way possible. Here's a list with issues where we need your feedback and insights in your real world usage of Serverless. We've already started filling in the next milestones. Check out the 1.17 milestone to see what we have planned for the next release. We hope that you like the new release! Let us know if you have any questions or feedback in our Forum or GitHub Issues. The Serverless Examples Repository is an excellent resource if you want to explore some real world examples and learn more about what Serverless architectures look like. Serverless provides a completely customizable and pluggable codebase. Our community has written a vast amount of awesome plugins you can install and therefore enhance the capabilities of the Framework. A list with all the different plugins can be found at our Serverless Plugins Repository. Don't hestitate to open up a PR over there if you've authored or found a new Serverless plugin! CLI autocomplete, Cognito User Pool Trigger event source, KMS Key support and more in the Serverless Framework v1.15 release. F# service template, deployment skipping when files not changed and more in the Serverless Framework v1.17 release.